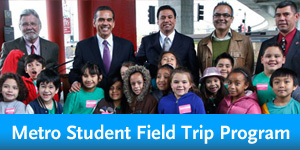 Metro's Community Education Team is excited to offer the Metro Student Field Trip Program to LA County Schools, grades 1-12. The program provides students, faculty and chaperones access to 21 approved destinations on Metro bus and/or rail service. All student and adult participants will be issued appropriate fare media to ride the system. Transit Safety Programs' main goal is to give informative safety programs to the community. The presentation can range from fifteen minutes to one hour, depending on your needs. Please visit our Metro Community Education website for more information on Metro's Transit Safety program. You can easily explore different neighborhoods in LA County. Have Metro drive you to your destination. Reduce your carbon footprint and help the environment. Stay active and get exercise by walking to bus stops and train stations.